It is estimated that there will be more than 75 billion connected devices until the year 2025. IoT has been one of the most amazing technologies. It has a simple concept yet very powerful. The IoT industry has seen a rapid growth and is merging with all other major industries. Automobile, healthcare, retail, etc. are using IoT to enhance customer service. IoT enables communication between two devices through an internet connection. Machines can even communicate with users through mobile apps and IoT. There are IoT supported ACs. users can turn on and off those ACs from a remote location. There are IoT supported refrigerators that send a message to the users about refilling of vegetables! It is estimated that 50 billion devices are going to be connected through IoT till 2020. IoT is expected to gain a profit of 19 trillion US dollars by the year 2020. From the devices having the potential to connect through IoT, only 0.06% are connected. 99.94% devices are yet to be optimized. Smart thermostats and smart refrigerators are some of the amazing IoT innovations. The above % is estimated to reach 28% in 2019. 94% of companies have got positive results from IoT. This technology can be extremely helpful in the construction industry. The major challenges for the construction industry are cost reduction and delays of projects. The construction industry and real estate are interlinked. The demand for real estate is growing at a skyrocketing speed. It is important to work on reducing project delays of constructions. The construction industry in the USA creates nearly $1 trillion in revenue every year. Every year thousands of construction projects take place in major countries like India, USA, and the UK. To overcome the issue of delay and cost, construction companies can take help of IoT. 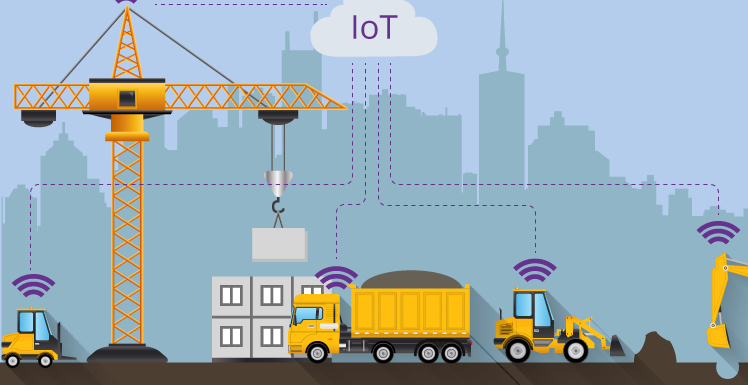 IoT sensors can be installed to the vehicles at the construction site, machines, and devices worn by employees etc. On a construction site, there can be various assets such as small equipment, machines, etc. it is important to track and maintain a record of these assets. The assets can be moved from one place to another on a construction site. Or it can be moved from one site to another. The tracking of assets becomes difficult in big construction sites. With the help of IoT sensors installed, employees can easily track the assets and make sure they are safe. Loss of assets can be expensive loss and also it can pause the construction for a long time. What if a land drilling machine breaks down on site on the first day of construction? The complete work gets delayed. The construction company either repairs the machine or rent another one. Both are costly solutions. Plus it requires a lot of time. Precaution is better than cure! Regular maintenance on equipment is a cost-effective solution. IoT sensors installed in the machine can credit and communicate maintenance requirements. With the help of IoT, these sensors send automated alerts for preventive maintenance. IoT sensors also detect fuel consumption. If the fuel consumption is more than required the machine definitely needs maintenance. The employees need not examine each asset personally. Remote monitoring can be done using IoT. Let us consider some different scenarios. Instant failure of a JCB can cause a major accident. What if the breaks of a transport truck fail? A worker with acrophobia ( fear of heights ) is working on the 10th floor. All these scenarios happen in real. It is extremely important to take care of such cases and prevent accidents. IoT sensors incorporated with construction sites can detect dangers such as fire or leakage of hazardous gas. These sensors immediately warn employees. Sensors in vehicles and machines can send messages regarding urgent need of maintenance. There is smart cap headwear which can detect health condition of workers. IoT can inform employees about inventory availability. The database of such devices stores available inventory details. These devices track the consumption of inventory. In such a way, these smart devices can inform the need of refilling. These devices also send reminders for refilling of inventory if needed. Construction companies use computer-based models. These are the dummy models with all information such as expected weather condition, energy efficiency, etc. IoT can update the BIM. IoT sends updated reports on the way materials are affected by climate changes or passage of time. It also tracks how structures behave in natural calamities. Every industry benefits from IoT. So is the construction industry. The cost is ultimately saved to a great extent using IoT at construction sites. The major challenge for this industry is avoiding delays of work. As the demand for real estate is increasing with an increasing population, people are building more space for themselves. People want better places to live or run offices. But they are not ready to give it a long time. To make faster constructions, it is important to adopt latest technologies like IoT. IoT helps in asset management, safety, repair, and maintenance. Mr. Hemendra Singh, Managing Director, also the co-founder of The NineHertz, an app development company is a visionary leader who oversees the corporate direction and successful growth of the Company and its employees, alike. With a career spanning nearly 10 years, Hemendra is the epitome of the new-age entrepreneurship in the emerging Digital India, who has catapulted The NineHertz to be counted among one of the foremost IT Companies in India.